A recent report by Allied Market Research looks at robotic surgery, and here are examples of different technological advances and use cases. The field of surgery is witnessing a period of great change because of phenomenal recent advances in surgical and computer technology. 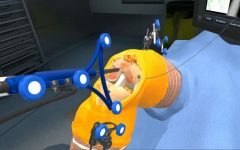 Robotic surgery could revolutionize treatment by providing precise, stable, and dexterous assistance to human surgeons. The best-known surgical robot, Intuitive Surgical’s da Vinci, is designed to improve clinical outcomes of patients through minimally invasive surgery. Robot surgery is finding application in many specialties. For instance, in neurosurgery, image-guided robots help examine brain lesions without causing any major damage to the adjacent tissue. In orthopedic surgery, robots are used to shape the femur to precisely fit prosthetic hip-joint replacements. Robots also find use in urological, gynecological, and general surgical procedures. The robotic surgery market has been making waves since the 1980s. This growth is attributed to the growing demand for automation in the healthcare industry overall, the greater focus towards minimally invasive surgery for faster recovery, and growing familiarity with robotics among healthcare professionals. The rising incidence rates of neurological, gynecological, and other disorders, whether from environmental exposure, aging populations, or genetic conditions, are another contributing factor. According to Allied Market Research, the global surgical robotics market is likely to reach $98 billion by 2024, experiencing a compound annual growth rate of 8.5% from 2017 to 2024. Several companies in the space are looking at innovation to improve surgical efficiency and extend their penetration in the market. In June, Restoration Robotics Inc., a leading robotic hair-restoration company in San Jose, Calif., launched a continuing education series for its ARTAS Robotic Hair Restoration System. Restoration Robotics’ Master Class is designed to educate physicians on best practices and recent techniques for this cutting-edge aesthetic technology. The Master Class is designed to support and advance their physicians’ knowledge in using the ARTAS Robotic System and improving the patient experience, said Ryan Rhodes, president and CEO of Restoration Robotics. In April, the Vanderbilt University Medical Center in Nashville, Tenn., added a new tool to offer patients the most advanced robotic-assisted surgical procedures. Vanderbilt added a new product to its collection of minimally invasive techniques. Thoracic surgery is the latest specialty at the medical center to adopt the da Vinci Xi, which allows surgeons to carry out complex procedures using a few small incisions. The technology brings several benefits for both patients and surgeons, said the medical center. It allows for precise and real-time movement of the instruments and an unparalleled view of the area under surgery. Each instrument in the system performs a certain task, such as clamping, cutting, dissecting, and suturing. The robot offers multiple advantages such as reduction of post-operative pain, shortened hospital stays, earlier patient mobility and faster recovery. In January, Henry Ford Allegiance Health, a Jackson, Mich.-based medical center, introduced the ExcelciusGPS from Globus Medical Inc. The robotic surgery system is designed for minimally invasive spinal surgery. Globus Medical’s navigation technology is designed to foster increased safety for patients and accuracy for surgeons. The incorporation of a GPS 3-D guidance system improves accuracy and optimizes patient care by integrating robotics with navigation, said the medical center. The ExcelciusGPS enables a neurosurgeon to place screws and implants precisely while seeing exactly where to place instruments in real time. The robotic surgery system creates safer, more consistent, and smaller incisions, leading to better healing and lessen scarring, according to Globus Medical. Sharmistha Sarkar has always had a keen interest in reading and writing. Though an engineering graduate, she forayed into the field of writing due to her love for words and the urge to do something different. Allied Market Research has given her the chance to gain knowledge about different subjects as a senior content writer.